Laura and David share a love of aviation. In 2008, they trained together for their Private Pilot's licenses, and they earned them on the same day! While David worked his day job as a Systems Architect to support their family, Laura worked on furthering her aviation career by achieving her Instrument Rating, Commercial license, Advanced Ground Instructor and Instrument Ground Instructor certificates, on her way to Certified Flight Instructor. Along the way, Laura and David discovered the wonderful world of Sport Flying. Though the Sport Pilot has limited privileges compared to a Private Pilot, it takes less time to achieve the certificate and, therefore, puts aviation within reach of more people. Also, Sport Pilot offers other fun aircraft such as Gyrocopters, Trikes, and Powered Parachutes -- all of which Laura and David hope to fly and teach in in the future. So Laura switched gears and earned her Sport Pilot Airplane Instructor certificate, and David soon followed. They very much enjoy sharing their passion of flying, and can't think of a better way to earn a living! Our 2016 little South African airplane, who we've named "Kitty", is an SLSA - Special Light Sport Aircraft - meaning that she was factory assembled and follows the FAA requirements for certification. Because of this special certification, we can legally give flight instruction in our plane. Kitty has a 100 hp Rotax engine which is more power than she needs to lift her strong, nimble frame. That, combined with her three blade prop, make for short takeoff distance and 800 ft/min zooming climb rates. Her skin is a very light, strong and durable, hi-tech, rip-stop fabric - the same used in racing yacht sails. She has a single sprung aluminum beam for her landing gear, which makes it incredibly strong as well as comfortably flexible, and her large wheels are perfect for grass landing strips. 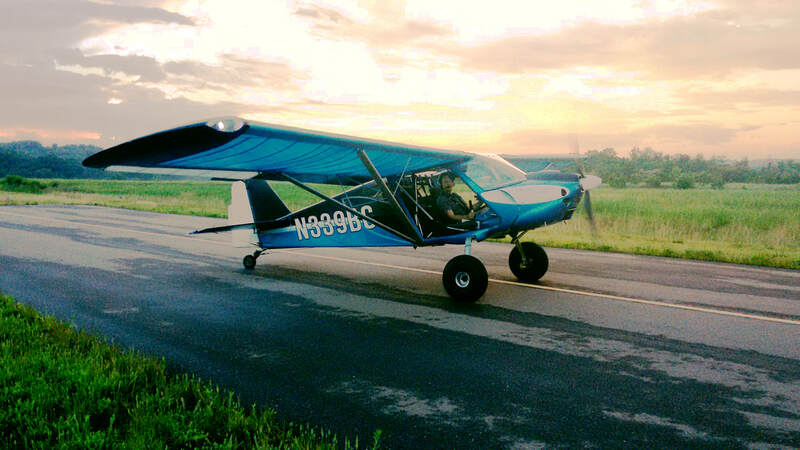 She is a tailwheel airplane, which makes her crazy fun to fly. She offers an amazing view from the cockpit due to her plexiglass wind screen, doors (which can be on or off depending on the flight conditions), and roof. We have one of around thirty BushCats in the United States. If you are interested in purchasing a BushCat, and you certainly might be after you see how awesome they are, we can hook you up. Just give us a call! KJZP is located in Jasper, Georgia, which is known as the "First Mountain City" and is located 50 miles north of Atlanta. Our airport has a welcoming, friendly atmosphere and excellent service. It welcomes the public to come grab a rocking chair with "Front Porch Gang" and enjoy watching the rich variety of aircraft taking off and landing on its well maintained runway. What makes it particularly special is the lovely grass strip they maintain for tailwheel aircraft such as ours and the many others that are based there. 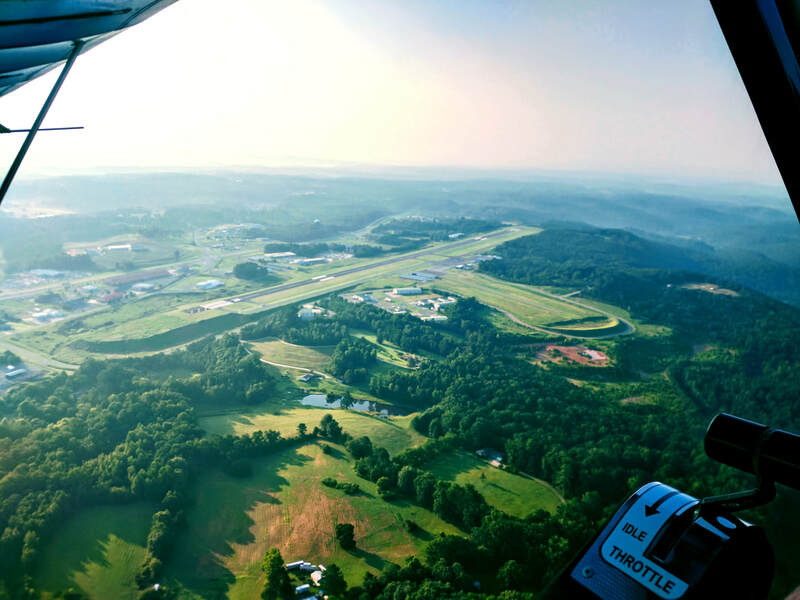 The airport is right next to the foot hills of Smoky Mountains, so the views are beautiful. We feel so privileged to be based out of this wonderful airport and to be apart of the airport family. We are conservative pilots & instructors and always put safety first. We find the open sky infinitely safer than the confined, crowded, and close hazards of speeding cars on the ground. We only fly within the limits of our aircraft and our training & experience. Our aircraft is an FAA Light Sport Certificated 2016 BushCat from SkyReach, and it is maintained above FAA certification standards. It has a certified 4-stroke, 100 hp Rotax engine, an extremely strong landing gear and larger terrain tires, high-tech rip-stop fabric, full avionics systems, VHF communications, primary and secondary GPS systems, four-point safety harnesses, and a fire extinguisher. Our plane is an excellent glider with a 10 to 1 gliding ratio. It is capable of landing with less speed (45 mph) and distance required (300 feet) than 97% of other aircraft. However, NO amount of diligence, maintenance, and experience can eliminate ALL risks. We have no interest in hurting ourselves, nor our equipment, nor YOU. But you will be taking a risk both on the ground and above it. Accidents can happen. Therefore we require all clients to sign a waiver releasing us and our company of any and ALL liability for their decision to participate. It is only under these conditions that we are willing to share this experience with the public.